John Guest Ltd prides itself on being at the forefront of innovative tube and piping connection technology. John Guest push-fit fittings have been specially designed for the telecommunications market, for use in local loop, network and customer box applications. 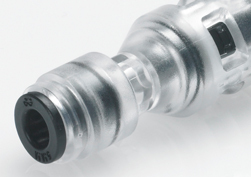 The extensive range of push-fit connectors is available to cover both blown fibre and cable pressurisation systems.